“The day turns into night, turns into day, and I’m still delirious” is part of the chorus for a song on Grace Potter’s new album “Midnight”. Bec quickly took a liking to it…though it’s a song about partying, we joked about the ICU delirium she suffered from occasionally this year in the hospital. Part of the reason it affects people is that there’s not much of a distinction between day and night and you often lose track of time. To combat ICU delirium, they say to have familiar faces around, have a window nearby, and play familiar music. We listened to this advice and the music we played most often in Becca’s hospital room was Grace Potter. Even while she was sedated and intubated during January, we felt it would help keep a positive mood in her room. It was then that I started an email exchange with Grace’s management that led to a sweet little surprise last night. 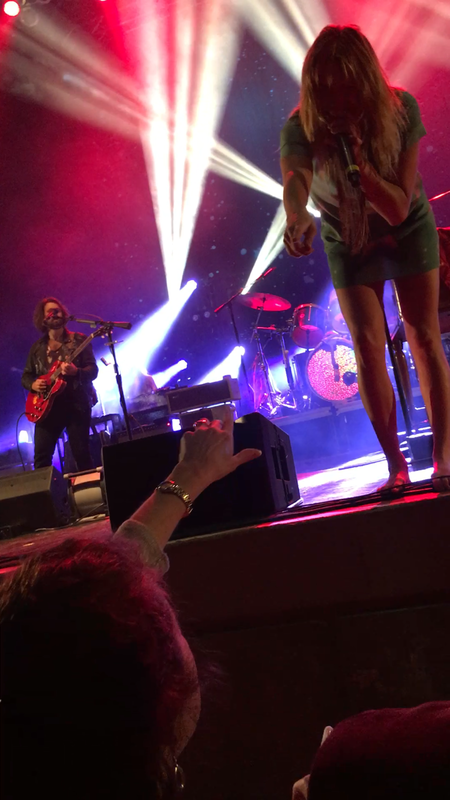 The email was titled “Beccalicious and Grace Potter”. Like a secret agent, I stepped away when I saw the call come in from the tour manager. 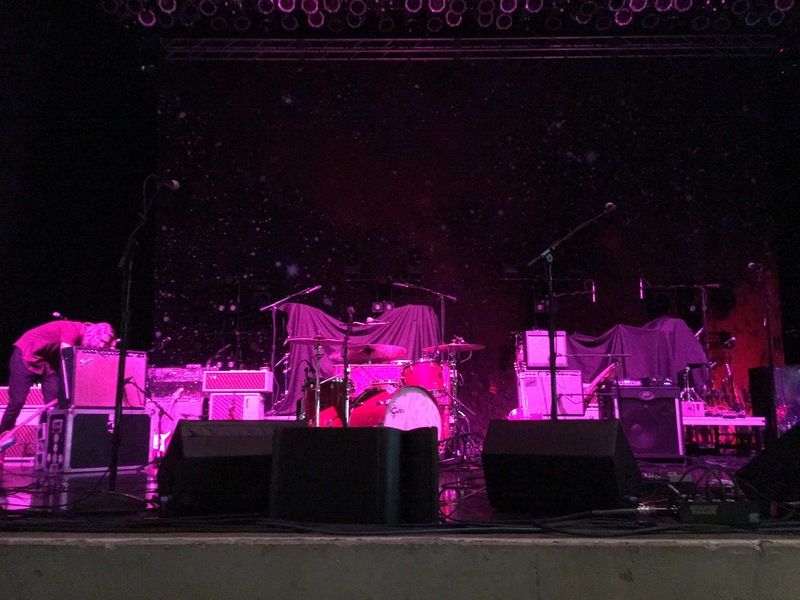 I received instructions to get her to the double doors left of the stage at 8:45. I was on it! I returned to Bec and played off coolly that it was the blood donation center calling. We had it all under control. I only started to get nervous at about 8:20 when Bec had to leave our spot to potentially throw up as her nausea often strikes at the least opportune times. Hoping her Ondansetron (pronounced ‘on Dance-a-tron’) would kick in quickly and wouldn’t cause us to miss this opportunity I asked our new friends next to us if they could hold our spots while we went backstage. They were more than happy to oblige. We chatted for longer than I expected and I got to tell her the story of our inside joke with “Delirious”. Bec was surprised that Grace knew her story and loved every second of the meet and greet. After a group shot it was time for the show. 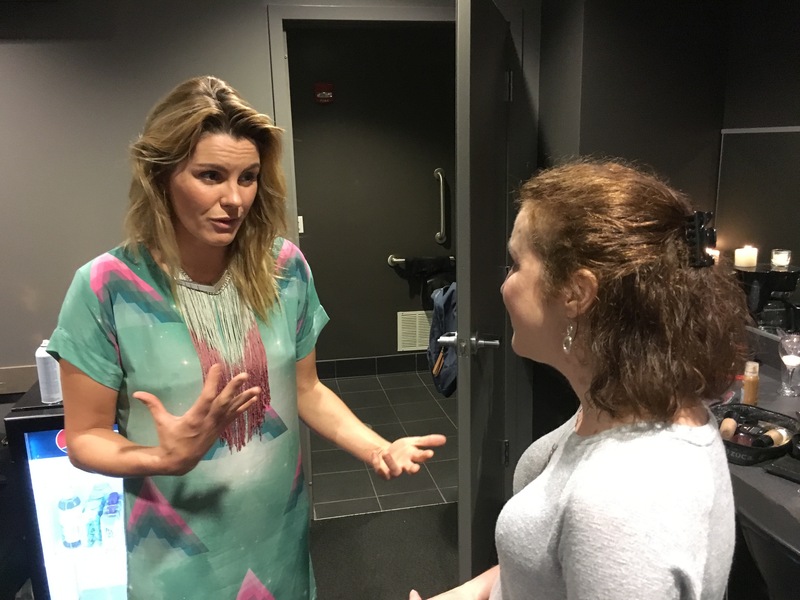 Grace said she would find us in the audience and she did. I only regretted the fact that I didn’t tell her how I had bought a guitar during her time in the hospital, mastered the G chord and (given enough time) could play the D chord in succession. I am pretty sure that she may have found a spot for me in her band right then and there. In any case, I will be sure to put that in the thank you note. I’ll try to post the videos on “The Rebecca Martello Poole Lung Transplant Journey” facebook page. A year ago today, we walked into an urgent care clinic in Granby, CO. Rebecca’s O2 saturation (sats) was 52% and the nurse couldn’t believe that she was able to stand in front of her. After some initial tests, they worried she could be septic and suggested we take her by ambulance to Denver. 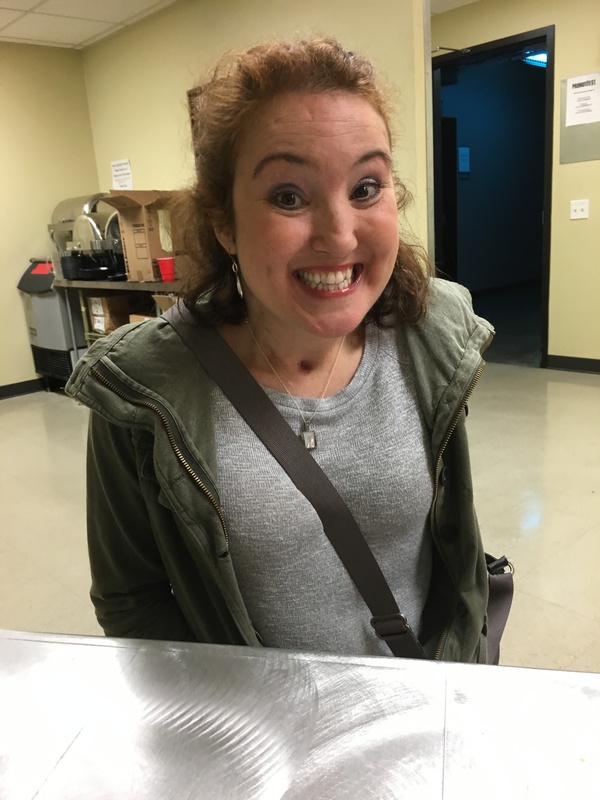 Our quick weekend away with friends turned out to be a major turning point in Rebecca’s health. While we sat there waiting for the doctor’s recommendation, Becca sent me on a mission to get her a snack. 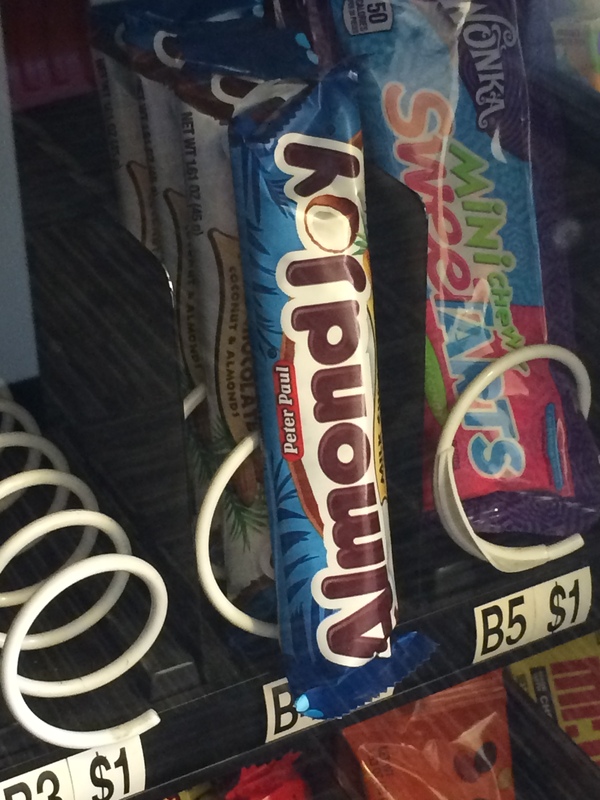 I figured I would get her the most joyous snack in the vending machine…the Almond JOY. Surprisingly, joy was not an emotion I felt in the moment pictured below. After pumping in $2 for a $1 bar, I walked away with the prize. Not surprisingly, Rebecca was not in the mood for any Almond JOY by the time I returned. I carried that $2 candy bar with me for the 90 mile ambulance ride as I texted her mom and sister to keep them in the loop. Her sats had never dropped that low. I had never seen her that sick. At the time, our major concern was sepsis, a life threatening condition caused by the body’s response to an infection. It was a major turning point in our mindset. In the course of one day, the lung transplant discussion became less frightening…by comparison. Our short weekend in the mountains quickly changed to a week in the hospital as we waited for her condition to improve enough so that she could fly home on settings that a portable oxygen concentrator could support. From then on, she took a wheelchair through the airports and always had O2 with her. It was also a major turning point for her health. She switched to supplemental oxygen almost 24 hours a day as her lung function dropped significantly. We later learned that she had experienced heart failure on the right side. Her heart needed to work so much harder because her lungs were slowly failing. What I learned from that situation was that you need to celebrate good news even when there’s bad news on the horizon and that keeping a positive attitude is a reminder of why recovering is so important.. I never did get my extra dollar back for that Almond JOY but we got our $2 worth!